From August 23 until August 30, Nextcloud held their annual conference, including an enterprise day, providing enterprise focused talks about large scale use of Nextcloud, security, scalability, Real Time & Secure Collaboration with Collabora Online, and much more. 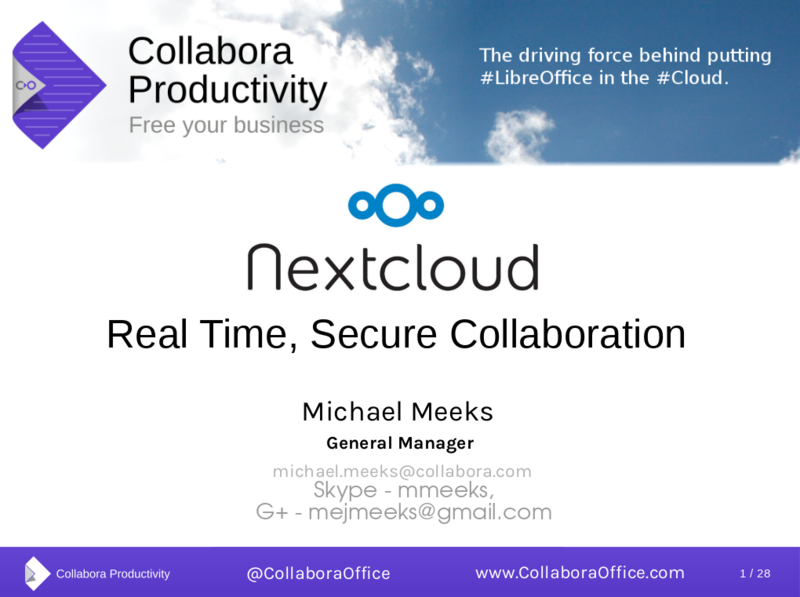 During the Enterprise Day, Collabora Productivity’s General Manager Michael Meeks gave a talk about Collabora Online in Nextcloud. Collabora Online is a powerful LibreOffice-based online office that supports all major document, spreadsheet, and presentation file formats, which is easy to deploy in Nextcloud, as a simple extension. Key features are collaborative editing and excellent office file format support. Come see us at ownCloud conference!